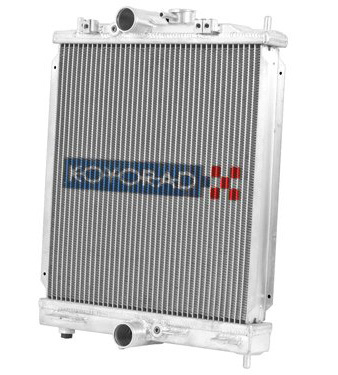 Koyo has released a half-length radiator for pure racing applications which typically involve short sprints, small track, autocross, and gymkhana. This is not recommended for street usage because the smaller core is not suited for stop and go traffic where the smaller core runs into decreased air flow. The reduced length of the radiator allows for an off-center mounting position, which keeps manifold heat away from its core. OEM electric fans will bolt on without any modifications. Unique sliding fan mounts allow for an easier installation of aftermarket universal slim fans, freeing up additional engine bay room and reducing weight. Note: This half sized radiator is intended for drag, small track, and short duration race vehicles only. Modifications may be required. Want this item shipped out tomorrow, April 26? Order within the next 23 hrs 23 mins.